Microsoft is revamping the email editor in Outlook for Mac, providing new options for working with images and adding new fonts. The biggest change is the ability to resize and rotate images. If you insert a very large image, for instance, you’ll soon be able to make it more reasonably-sized for email recipients. 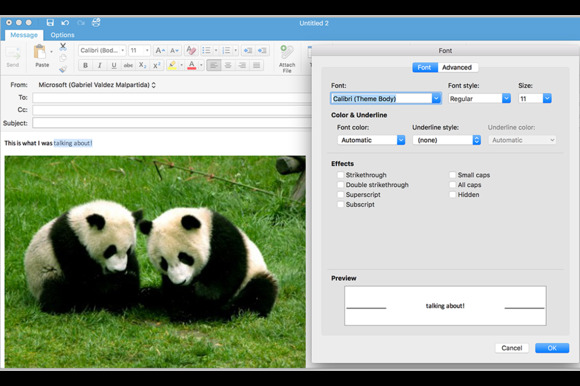 Users are also getting access to a broader set of fonts, font colors, bulleted lists and other formatting options. The changes will roll out in mid-May, Microsoft says, starting with people who are part of the Office Insider early release program. The update is important for the features it provides now, and also for those it will support in future, including tables. Currently, tables have to be copied from another Office program like Word or PowerPoint.